Bulk processing, List lookups and API in one easy step! to 2 millions urls per file during "short time"
Domain Authority (DA) - number from 1 to 100 (higher - better) provided by Moz and predicts how DOMAIN will be ranked on search engines, DA linked with link counts, MozRank, MozTrust scores and other data. 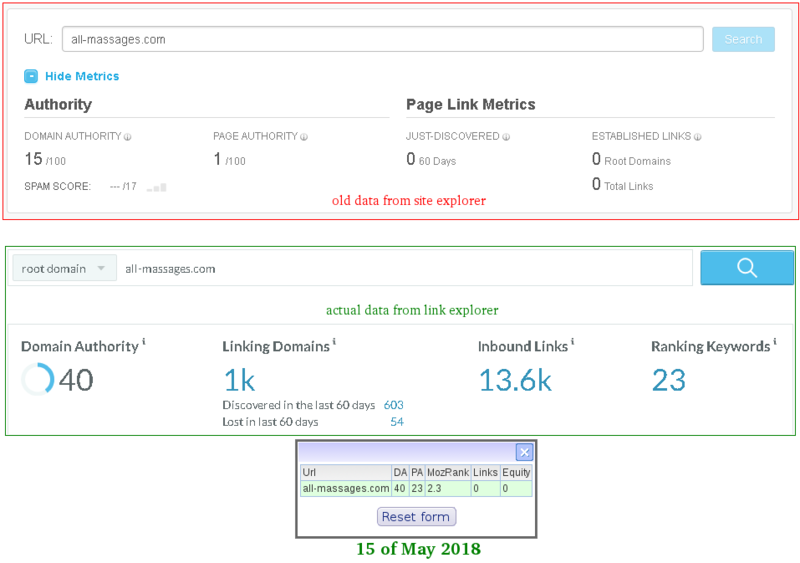 Page Authority (PA) - number from 1 to 100 (higher - better) provided by Moz and predicts how URL will be ranked on search engines, PA linked with link counts, MozRank, MozTrust and other data. Moz Rank (MozRank) - represents a link popularity score that showing the importance of given web page on the Internet. Links In (Links) - number of links (equity or nonequity or not, internal or external) to the URL. External Equity Links (Equity) - number of external equity links to the URL. Significant changes in MOZ processing are possible from 29 of March, we do not promising that MOZ processing will continue to work. Alexa Rank (a_rank) - global Alexa rank of domain. ALexa Links number (a_links) - number of links to domain. Alexa Country (a_cnt) - ISO2 code of country where domain is the most popular. Alexa Country Rank (a_cnt) - Alexa Rank of domain in country where it is popular. SemRush Domain (sr_domain) - domain that was taken by SemRush from url for analysis. SemRush Rank (sr_rank) - rank of domain according to SemRush. SemRush Keywords number (sr_kwords) - number of keywords where site in Google's organic search top 100. SemRush Traffic (sr_traffic) - number of users expected to visit the website during the following month. SemRush Costs (sr_costs) - estimated price of organic keywords in Google AdWords. SemRush URL Links number (sr_ulinks) - number of links to URL according to SemRush. SemRush HOSTNAME Links number (sr_hlinks) - number of links to HOSTNAME. SemRush DOMAIN Links number (sr_dlinks) - number of links to SemRush Domain . Status - "Found" or "NotFound" or "unknown", found or notfound are statuses of url in Majestic system, unknown mean that our service failed to get data from Majestic. IP Addresses (IPS) - number, IP addresses which hosts at least one website that referring to url or domain. Class C Subnets (CCS) - number, C Subnets which hosts at least one website that referring to url or domain. Trust Flow (TF) - number, it displaying how trustworthy a page is based on how trustworthy sites tend to link to trustworthy neighbors. Citation Flow (CF) - number, it displaying how influential a URL might be based on how many sites link to it. ** Topical Trust Flow Topic 2-9 and Topical Trust Flow Value 2-9 are not accessible through list checker, but accessible through API and bulk checker. Get data from MOZ, Alexa, SemRush and Majestic in one easy step! 2 Apr 2019: We currently trying alternative way for process MOZ data, data will be the same accurate but processing will be much slower. 15 March 2019: MOZ informed us about possible change of price for our processing after 29 of March. We having discuss with MOZ about new price but we are not sure that it will be successful and do not promising that MOZ processing will work after 29 of March. We asking our customers to use MOZ processing on our site as much as possible until price is "like for free" (bulk processing will be the best choice). My-Addr Project is not responsible for informing customers who turned off news or using invalid emails. 15 Dec 2018: Improvements for Majestic processing, fix to bug with old prices. 8 Dec 2018: There was some delays in processing of MOZ+Alexa+SR, it happens because of maintenance, we did massive speed up of SemRush processing. 25 Nov 2018 Processing of Majestic data was down during last 24 hours, it was linked with changes on Majestic, processing is restored. 3 Nov 2018 Price for Majestic processing is increased twice. 16 Sep 2018 There was too many files uploaded and it was the reason of big delay in processing. We did fixes and situation and files will be finished during next few hours. 13 Jun 2018 API for Majestic was launched, please read documentation before usage. 11 Jun 2018 Fixed bug with freezing of some files during Majestic processing. 9 Jun 2018 We restored bulk processing of Majestic data and amount of fields was increased. 16 May 2018 Data from "site explorer" is completely out of date, but our service providing actual data, screenshot. 15 May 2018 Majestic was turned off for few weeks, we remaking interface. 15 May 2018 Spam Score was removed from our site. 19 Apr 2018 MOZ changed some network settings and that was the reason why all bulk processing for MOZ was suspended. Problem is already fixed. 02 Nov 2017 Access to Spam Score data is restored, 100% of service working. 10 Oct 2017 (FIXED) Processing of files was stopped to 10 hours, it happens because of issue with one of our servers. 13 Sep 2017 (FIXED) We have problem with one of our servers because of data center. This issue is the reason of big percent of "unknown" results. Cheap Page Authority, Domain Authority, Trust Flow, Citiation Flow bulk checker from My-Addr Project.